Anne lives in a village in Kent with her husband, four children, two dogs, and three hens. She has worked as a bookseller, a university lecturer, and in a residential care home. 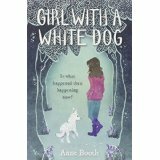 Girl With a White Dog was nominated for the Carnegie Medal and shortlisted for the Waterstone’s Children’s Book Prize. Find Anne on Twitter @Bridgeanne and at https://bridgeanneartandwriting.wordpress.com. 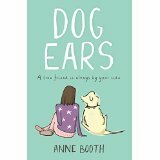 Dog Ears: I’ve got to tell someone, and you’re the best listener there is. Mum is asleep with Jack upstairs, Dad’s not here and Gran hasn’t arrived yet – and you know what, Gran never listens anyway. Basically, the whole school has gone mad. 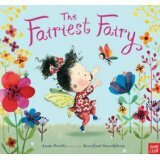 Anna and her friends can’t believe that popstar Pippa Green is coming to their school to judge a singing competition. They’re going to be famous! But beneath her happy exterior, Anna is struggling. Her dad is working abroad and all her mum’s time is taken up with worrying about ill baby Jack, so Anna is left to keep things together. The only person she can talk to isn’t even a person; he’s her dog, Timmy. With so much to do, Anna is sure she’s going to let everyone down. She starts to dream of running away, with best friend Timmy at her side. But she’d never do anything crazy like that… would she? Anna’s spent all her time worrying about everyone else – now they need to worry about Anna.